Energy Enhancer patches stimulate acupuncture points on the body for improving the flow of energy and produce drug-free energy enhancement within minutes of use. Traditionally, acupuncture points are positions on the human body located on lines of energy or energy channels called meridians into which an acupuncture needle can be inserted to exact a benefit. Accupuncture points are also called acupoints. Instead of needles, non-transdermal patches are used to obtain the same desired health benefits. Energy Enhancer patches are the new approach to improved performance. The LifeWave™ nanotechnology patch system allows organic materials to interact with the human body to improve energy, performance and stamina without ingesting anything. World class athletes and coaches have discovered the benefits of using LifeWave™ Energy Enhancer patches during competition. Double blind university studies have shown that stamina can increase over 20% in the first use. It is believed that the patches communicate the information needed to initiate the transport of fats to the cells for ATP production (the basic unit of energy in every cell). Clinical studies have shown an increase in energy and strength endurance within minutes of use. Energy Enhancer patches are not transdermal patches. Energy Enhancer patches are free of stimulants. Energy transfer occurs between the user and the patches. No chemicals enter the human body. LifeWave™ technology in the patches communicates with the body through the human magnetic field. 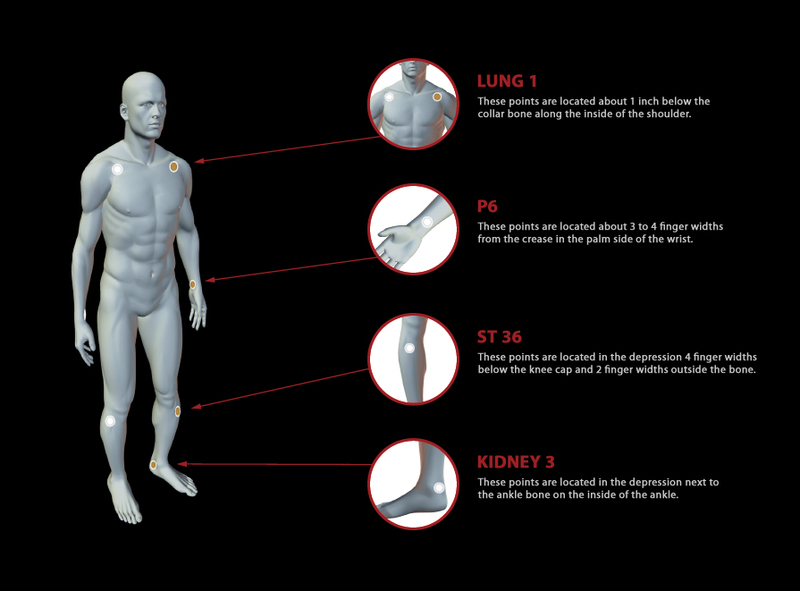 Place one set Energy Enhancer patches on the body, using one of the locations shown below. Always place the white patch on the right side of the body and the tan patch on the left side of the body. Apply the patches to clean and dry skin in the morning. Patches may be worn for up to 12 hours before discarding. Keep well hydrated while using this product. Do not reuse patches once removed from skin. Do not use more than one set of patches on the body at the same time. These points are located in the middle of the back of the wrist, about 2 finger widths above the wrist crease. Each point location brings special health benefits as defined by existing official acupuncture charts. This video is an introduction to what the Energy Enhancer patches are and how they should be applied with respect to the various bioelectrical zones of the body. Several acupuncture points are suggested to maximize the health benefits of the patches and improve the flow of energy in the body. Duration of the video: 4 min. 26 sec. The Energy Enhancer patches come as a white patch known as a positive patch, and a tan patch known as a negative patch. The reason is that the body is divided into two bioelectrical zones, one positive and one negative. We will be applying a white positive patch to the positive side of the body and a negative tan patch to the negative side of the body. For instance while using the Pericardium acupuncture position, the user should apply the white patch on the right wrist and the other tan patch on the left wrist. The meridian is the Pericardium which is in medical terms represents a double-walled sac that surrounds and protects the heart and the roots of the great vessels irrigating the heart. Lung 1 is another location specifically suited for athletic performance. Stomach 36 is another acupuncture point that stimulates the stomach meridian, while Kidney 3 and San Jiao 5 are other suggested acupuncture points. Patch users are invited to monitor how they feel during each day, as every individual responds to the stimulation of acupuncture points differently. They are also invited to repeat the cycle or select their most responsive location. Other patch locations are available from the LifeWave company's research. 1.- What should you notice when wearing the Energy Enhancer patches? You probably will feel nothing. What you should notice is vey constant and stable levels of energy during your day. If you are performing an athletic activity you will be able to measure improvements in how many reps of an exercise you can perform or how long you can exercise without getting as fatigued. 2.- Does everyone respond to the patches? Over 85% of the individuals that use the LifeWave™ patches experience improvements in their energy and stamina within the first 10 minutes of use; the remaining individuals often need to use the patches for a few weeks to experience all of the product's benefits. Do not expect to feel different when using the patches. Most users do not get an energy buzz or a sort of a "caffeine hit." Be sure to apply the patches correctly using 1 set of tan and white as stated in the directions. Vary the location until you find the right spot for you. In unusual circumstances, the body can take up to two weeks to respond. Dehydration is a common reason why some people do no respond to the patches. Drink a full glass of water prior to exercise while using the patches. 3.- How do the Energy Enhancer patches work if nothing enters the body? LifeWave™ Energy Enhancer patches communicate with the body through the human magnetic field. This is known as resonant energy transfer. They send the message, transport fat to the mitochondria and make ATP to the cells. This produces increased energy. 4.- Is this a transdermal patch? Does any herb or chemical go into the body? Nothing enters the body. LifeWave™ Energy Enhancer patch is not a transdermal patch. This is based on completely new science and is a new approach to energy and well-being. 5.- Are the Energy Enhancer patches safe to use? All materials in LifeWave™ Energy Enhancer patches are listed by the FDA. LifeWave™ is manufactured at FDA registered facilities. The Energy Enhancer patches are in the FDA database. If you have a health condition or are in doubt please consult your doctor before using. 6.- What should I feel when wearing LifeWave™ Energy Enhancer patches? You will probably feel nothing. What you should notice is very constant and stable levels of energy during your daily activities. If you are performing an athletic activity you should be able to measure improvements in performance. 7.- Have the LifeWave™ Energy Enhancer patches been clinically tested? Yes, LifeWave™ Energy Enhancer patches have been tested in many clinical studies by some of the best researchers in the USA. These double blind placebo controlled studies prove the effectiveness of LifeWave™ Energy Enhancer patches. 8.- How long should I wear the patches? It is recommended that you wear the patches for no longer than 12 hours to 14 hours per day. Generally, wearing the patches on alternating days produces the best long term effects. 9.- How often should I wear the patches? 4 days on, 3 days off or unless instructed otherwise by your physician. 10.- How do I keep the patches from falling off? The Energy Enhancer patches use a Band-Aid® grade hypoallergenic adhesive and are affected by body oils and dirt. The skin should be clean and dry for general application. Football players apply the patches to the wrist and then tape the wrists to ensure that the patches stay in place. Swimmers clean the application spot with alcohol and then apply the patches, generally to the shoulder position. Golfers wear them at the knee position. Other heavy users use wrist bands to hold the patches in place. 11.- What is the difference between the two patches, the white and the tan patch? The white patch is positive. The tan patch is negative. They interact passively with the body's electromagnetic field. Both patches are required for maximum effect. 12.- Can I wear a metal watch with the patches? Yes, but place the patches at a spot other than the wrist. The patches should not be worn near metal.